Open Car Transport is a vehicle shipping type during which your car is transported in an open trailer, attached to the flatbed. You probably have seen those trucks on highways. Generally, they are double or single decker auto shipping trailers. When Is Open Car Transport needed? Open Car Transport is needed in many cases. These cases include buying a new vehicle in a different destination, moving out of state or getting a new job in a state different than yours. 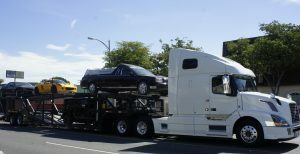 Moreover, Open Car Transport is one of the most general and affordable ways to ship a vehicle. In general, this method of auto transport is safe and secure in general. However, sometimes weather conditions may affect your vehicle. At San Diego Auto Shipping we know that the main concern of our customers is the safety of their vehicle. You do not need to worry about the safety of your vehicle when you trust its safety to San Diego Auto Shipping. We provide your vehicle with full insurance. This means that once we pick up your vehicle, we become responsible for it. This is the reason, you can be sure that San Diego Auto Shipping would deliver your vehicle to your preferred location in the same condition that it was picked up. Also, San Diego auto shipping crew consists of skillful professionals who are experts in their field. Furthermore, we cooperate only with experienced and qualified truckers who will take care of your vehicle as their own. In addition to open car transport, expedited as well as door-to-door open car transport auto shipping services are available at San Diego Auto Shipping as well. Our free quote is available online. Fill it out. We will review it and get back to you as soon as possible.